Kuppam -517425, Chittoor District, Andhra Pradesh, India. Porokeratoses are a group of hereditary or acquired disorders characterized by annular plaques with an atrophic center and a hyperkeratotic peripheral ridge. Pathologically, porokeratosis is characterized by the presence of abnormal clones of keratinocytes that form a column of parakeratotic cells, called the coronoid lamella. These lesions are most commonly found on the extremities, but can also be found on genitalia, face, oral mucosa and cornea. This report describes a 26 year-old male patient, with porokeratosis of Mibelli confirmed histopathologically. The rarity of this disorder, its clinical exuberance and the destructive character of the lesions, as well as nasal involvement, unusual in this form of porokeratosis. Rare presentation. Porokeratosis include a group of heterogeneous disorders that represent diverse phenotypic expressions of the same genetic defect, which is mainly inherited in an autosomal dominant form. These include Classic Porokeratosis of Mibelli, Disseminated superficial actinic porokeratosis, punctate porokeratosis, porokeratosis palmaris et plantaris disseminate and linear porokeratosis. Atypical types are facial and giant porokeratosis, porokeratosis ptychotropica and porokeratoma. In addition, there are the rare forms of porokeratosis, i.e. porokeratotic adnexal ostial nevus, porokeratotic eccrine ostial and dermal duct nevus and porokeratotic eccrine and hair follicle nevus. Other forms are punched-out, hypertrophic verrucous and reticulate porokeratosis. Porokeratosis are characterized by annular lesions with an atrophic center and a prominent peripheral ridge. Pathologically, porokeratosis is characterized by the presence of abnormal vacuolated keratinocyte clones that develop in between normal cells, with no granules, and which eventually form a column of parakeratotic cells, a rim called the coronoid lamella. Porokeratosis of Mibelli is referred to the more localized form of this disorder usually manifesting as solitary or a small group of lesions. It was first described by Mibelli in 1893 who described atrophic patches clinically and histologically coronoid lamella. These lesions are most commonly found on the extremities, but can also be found on genitalia, face, oral mucosa and cornea. Though the patches are generally asymptomatic they can often lead to ulcerative, verrucous, giant, and malignant lesions. We describe a case of Porokeratosis of Mibelli at an unusual site in a 26 yr old male. The presenting history, clinical findings, biopsy results and available literature are reviewed. 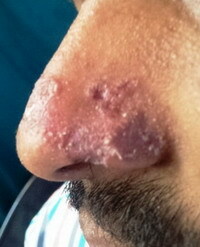 A 26 -year-old, married, born of non consanguineous parents, unemployed presented with multiple skin lesions over nose. 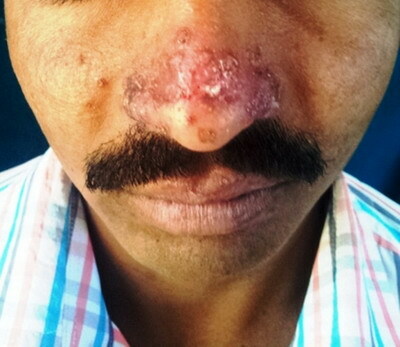 He had been suffering from multiple pigmented annular plaques and papules over nose for 2 years. The lesions were slowly progressive with no signs of self-healing. He had been normal physical milestones of development as a child. He appeared to be immunocompetent with no history of recurrent infections or any other skin lesions. His parents and siblings (1 brother) were all normal and healthy. He had no family history of a similar condition or other skin problems. His medical history was unremarkable with no other obvious complaints. The physical examinations were within normal limits. On systemic examination no abnormality was revealed. Clinically there was no evidence of sexually transmitted diseases. Following investigations of complete blood counts, ESR, VDRL and HIV were within normal limits. The differential diagnosis of Psoriasis, Linear verrucous epidermal naevus, Squamous cell carcinoma, Porokeratosis, Actinic Keratosis, Lupus Vulgaris, Basal Cell Carcinoma, and Discoid Lupus Erythematoses were considered. A full depth skin biopsy was taken from the outer part of the lesion with a 2 mm disposable skin biopsy punch and subjected to histopathology. 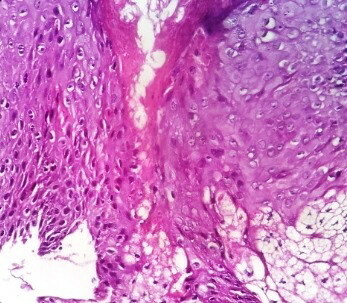 The histopathology revealed foci of epidermal invagination filled with keratin and parakeratotic coronoid lamella (Fig 3) . Dermis showed a mild to moderate infiltrate of lymphocytes (Fig 4). On the basis of history, clinical examination and histopathology, a diagnosis of Classical Porokeratosis of Mibelli was made. Topical tretinoin was prescribed for the management of the lesion. Porokeratosis is a clonal disorder of keratinization characterized by one or more atrophic patches surrounded by a clinically and histologically distinctive hyperkeratotic ridge like border called the coronoid lamella. Porokeratosis of Mibelli may be familial, inherited as an autosomal dominant disorder with the onset in childhood or sporadic with later onset. Clonal proliferation of atypical keratinocytes showing abnormal terminal keratinocyte differentiation leads to the formation of the coronoid lamella, that corresponds to the raised, hyperkeratotic border observed clinically. The atypical keratinocytes show abnormal differentiation but do not show an increased rate of proliferation. Porokeratosis of Mibelli is the most characteristic and distinctive variant of the five described forms of porokeratosis. The classical form of Mibelli consists of a single plaque, or a small number of plaques, of variable size and most often affects the limbs, particularly the hands and feet, the neck and shoulders, although any part of the body may be affected including the mucous membranes and scrotum. Natural or artificial ultraviolet radiation, electron beam therapy, and extensive radiation therapy are well established trigger factors for Disseminated superficial actinic porokeratosis and Porokeratosis of Mibelli. Disseminated superficial actinic Porokeratosis may coexistent with Linear Porokeratosis. Porokeratosis may be associated with Diabetes mellitus,HIV infection, liver disease , Renal transplant , and hematologic or solid organ malignancy. Histopathology of Porokeratosis shows hyperkeratotic lesion with discrete Parakeratotic column at margin. Diagnostic feature is Coronoid lamella which represents visibly raised margin of the lesion. It is a Parakeratotic column overlying a small vertical zone of dyskeratotic and vacuolated cells within the epidermis along with focal loss of granular cell layer, mild lymphocytic infiltrate may be seen. In our case represented clinically showed annular papules, annular plaques with central clearing and raised peripheral edge over nose, coronoid lamella on histopathological examination. We confirmed diagnosis of Classical Porokeratosis of Mibelli. The management of Porokeratosis includes many options. The approach to treatment is individualized and based on many factors, such as lesion size and location, risk of malignant transformation, and functional and aesthetical considerations. Sun protection, emollients, and observation for signs of malignant degeneration are mandatory. It has been treated with topical 5-fluorouracil, CO2 Laser vaporization, Cryotherapy, Topical Retinoids, Imiquimod, Shave excision, curettage, linear excision, Photodynamic therapy and dermabrasion with variable success. A classical form of Porokeratosis over nose is an uncommon condition, rarely seen and it is easily confused with other chronic skin disorders. Usually Patients never seek advice because lesions may remain asymptomatic. Histopathological examination required for diagnosis and early identification of neoplastic changes. Hence we reported 26 years male patient with Porokeratosis of Mibelli over Nose - Rare Entity. Two cases had reported so far[16,17]. 1. Ruiz Villaverde R, Alonso Corral MJ, Sanchez Cano D, Pacheco Sa´nchez-Lafuente FJ: Linear Porokeratosis of Mibelli. An Pediatr (Barc). 2005;63: 376-7. 2. Bacharach-Buhles M, Weindorf N, Altmeyer P: Porokeratosis Mibelli gigantea. Hautarzt. 1990; 41:633-5. 3. Lin JH, Hsu MM, Sheu HM, Lee JY: Coexistence of three variants of porokeratosis with multiple squamous cell carcinomas arising from lesions of giant hyperkeratotic porokeratosis. J Eur Acad Dermatol Venereol. 2006; 20:621-3. 4. Wallner JS, Fitzpatrick JE, Brice SL. Verrucous porokeratosis of Mibelli on the buttocks mimicking psoriasis.Cutis.Nov 2003;72(5):391-3. 5. Rachael Hartman MD et al: Porokeratosis palmaris et plantaris disseminata or a disseminated late-onset variant of porokeratotic eccrine ostial and dermal ductal nevus (PEODDN) with follicular involvement. Dermatology Online Journal 15 (8): 8. 6. Jurecka W, Neumann RA, Knobler RM: Porokeratoses: immunohistochemical, light and electron microscopic evaluation. J Am Acad Dermatol. 1991;24:96-101. 7. Murase J, Gilliam AC. Disseminated superficial actinic porokeratosis co-existing with linear and verrucous porokeratosis in an elderly woman: Update on the genetics and clinical expression of porokeratosis. J Am Acad Dermatol. Nov 2010;63(5):886-91. 8. Nakamura M, Fukamachi S, Tokura Y. Acute onset disseminated superficial porokeratosis associated with exacerbation of diabetes mellitus due to development of anti-insulin antibodies.Dermatoendocrinol. Jan 2010;2(1):17-8. 9. Rodriguez EA, Jakubowicz S, Chinchilla DA, Carril A, Viglioglia PA. Porokeratosis of Mibelli and HIV-infection.Int J Dermatol. Jun 1996;35(6):402-4. 10. Hunt SJ, Sharra WG, Abell E. Linear and punctate porokeratosis associated with end-stage liver disease. J Am Acad Dermatol. Nov 1991;25(5 Pt 2):937-9. 11. Herranz P, Pizarro A, De Lucas R, Robayna MG, Rubio FA, Sanz A. High incidence of porokeratosis in renal transplant recipients.Br J Dermatol. Feb 1997;136(2):176-9. 12. McDonald SG, Peterka ES.Porokeratosis : treatment with Topical 5- fluorouracil. J Am Acad Dermatol 1983 : 8 : 107. 13. Rabbin PE, Baldwin. Treatment of Porokeratosis of Mibelli with CO2 laser vaporization versus surgical excision with split thickness skin graft: a comparison. J Dermatol Surg Oncol 1993; 19: 199. 14. Levitt J, Emer JJ, Emanuel PO. Treatment of porokeratosis of Mibelli with combined use of photodynamic therapy and fluorouracil cream. Arch Dermatol. 2010;146:371-3. 15. 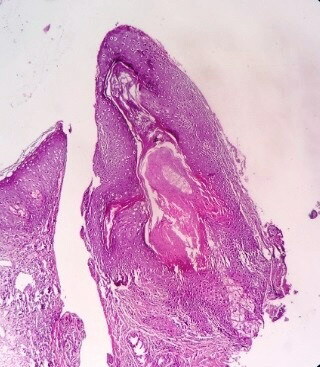 Valdivielso R. Genital Porokeratosis. Actas Dermosifiliogr. 2008; 99: 217-20. 16. Ghorpade A. 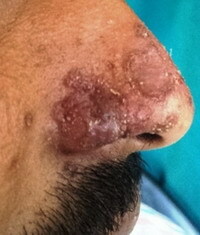 Localized actinic nasal porokeratosis. Clin Exp Dermatol. 2010;35:211-2. 17. Chaudhary RG, Bilimore F, Katare SK. Large annular plaque with central atrophy over nose. Indian J Dermatol Venerol Leperol. 2009;75:552.